The Bamboo Project: How Can We Facilitate Conversations BETWEEN Commenters on Our Blogs? How Can We Facilitate Conversations BETWEEN Commenters on Our Blogs? Over at Building a Better Blog, we've been talking about blog conversations. On most blogs, commenting looks like the top part of this image--the author posts and then commenters respond to the author. 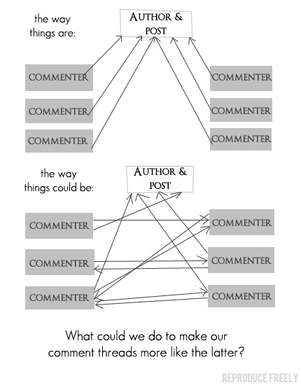 But as Skelliewag (the source of this graphic) points out, true conversation is really about the second half of this image--the author and commenters all interacting with one another. The question is--how, as bloggers, can we facilitate discussions between commenters? For myself, I've noticed that I tend to want to comment on a post based on what the blogger has written. I may or may not read what others have said. I'm usually too busy formulating my comment in response to the blogger to really pay that much attention to interacting with other commenters. Another part of my reasoning in not interacting with commenters is that I'm less assured of a response from them. Presumably the blogger is aware when I comment and will read what I said, but commenters may not be keeping track of the conversation and so my interaction with them is more likely to just blow in the wind. Feels like kind of a waste. I suspect that there are some aspects of a blog that don't lend themselves to this kind of conversation. Blogs do tend to be about an individual "talking" and others responding to that individual, unlike in a forum where anyone can start a conversation. And while commenters feel like they "know" the blogger and therefore are more comfortable responding, other commenters are very much a mystery, unless commenters know one another because they also read one another's blogs. It's kind of like being at a party--you're more comfortable interacting with a friend than you are with someone you don't know, especially if you're engaging them on a more contentious subject. Despite this, I think there are still ways to try to better facilitate interactions. One idea, of course, is to make it clear in your commenting policy that you encourage commenters to interact with one another. Another, as Christine Martell suggested in our discussion, is to have some commenters modeling the behavior--responding directly to other commenters as a way to encourage that kind of interaction. But that assumes you have a commenter willing to do this. Using threaded commenting so that you could reply more easily to individual commenters, similar to replies in a forum. Posting on problems to solve that will invite readers to interact with one another in developing the solution (obviously this doesn't work for every post). Trying to create a culture that encourages commenter to commenter interactions through your own responses in the comments section--maybe by drawing the attention of one commenter to the thoughts of another. This whole topic is fascinating to me as I become further drawn into the culture of blogging and consider how we use blogs to create and nurture community. In some ways, blogging may not be the perfect community tool. There are elements of blogging that aren't about community necessarily. At the same time, I think that we can be more purposeful about building community by thinking through some of the characteristics of a "real-life" one. No one goes to an event to interact only with the host. They also interact with other participants. The question is, if community-building is one of our goals as bloggers, how do we create that sense of community through our actions? So, how do you encourage interactions with commenters on your blog? How do you interact with other commenters when you comment on someone else's blog? Hi Michele, an interesting one. I've noticed on some of my posts, that some articles create conversation well, and other posts have readers emailing me on specifics rather than commenting. And other posts, well no comments or discussion at all! In August, I added some extra features to my comments box which have made a great difference (thanks to the BB31days challenge!). Those that want to comment can be updated every time some one else comments too, and also those too shy to comment can sign up for updates on the conversation on that article. During the BB31days project, we were all commenting and conversing lots on each others posts and articles as we were journeying together in different ways along the same road. Comments are great for community building, and also for the writer too, we all love receiving them! It would help further if the comment policy is "implemented" by the blog author and encouraging/causing "cross-commenting"
Thank you for a very thoughtful post! Thanks for your comments, Laura and Atul. I DO wish that I had the comment features available through Wordpress--those would definitely help--but alas, I'm using Typepad and I'm not prepared to do the switch at this point. I know I need to work on how to create the cross-commenting between commenters, but sometimes it's just not possible. Like in this example, I wanted to figure out how to get you two to connect to each other, but came up with nothing! :-) So I guess I have to keep working on it. For tracking conversations, I use co.mments so I do actually know if someone replied to my comment. Sometimes I use it to track the conversation even if I'm not actively participating; I was "lurking" in the conversations about transparency for a few days before I actually added anything of my own. Making it easier for people to track comments, as Laura suggested, definitely helps though. Part of it boils down to the fact that blogs really are designed more for the conversations around one person's ideas than around each other's ideas. Conversations that are really in-depth are often more suited to become actual posts, either on the original blog or on the commenter blogs. And blogs in general are more for parallel dialog than direct dialog; George Siemens wrote about this idea last January on his connectivism blog. Much of the conversation with blogs isn't through comments, but through other blog posts responding to those ideas. I wonder though, if you wanted to encourage cross-commenting, if you could ask leading questions in your replies. For example, it could be something like "Christy, what do you think of Atul's idea X?" Granted, this particular conversation isn't probably the best for that; I'm not sure what you'd do here to tie ideas together. But other conversations, like with the transparency, could have more potential for leading questions. My guess is that often people won't come back to do anymore, but maybe sometimes they will. This is a hard question encouraging people to develop conversations. But I can say I don't like "threaded commenting so that you could reply more easily to individual commenters, similar to replies in a forum". A well known educational blogger has done exactly that and what happens is you end up feeling that your comment is not valued. You really need to make the effort to comment back to people individually where possible -- so if you add thread the blogger should comment on each comment -- or not use threads. @ Sue: I think I know what you mean by I don't like "threaded commenting", I agree with the 'loss of impact' like in a forum. Obviously, threaded wasn't a good word there to use. I think I'll stick to cross-linked comments (though it doesn't make a whole lot of sense either. More like what we see in the image in this post - the way things could be. @ Christy: I agree, that at this time (awaiting certain basic standards with all blog hosting service providers), "Christy, what do you think of Atul's idea X?" is probably a better bet - in a way it also addresses the problem of 'loss of impact' that Sue talks of. My small effort would be to @Name my comment to create a 'conversation', like in this comment. And your point about the 'purpose' of blogs is also well taken - which will probably have to be Michele's next post - now that blog posts are cross-linked as comments/responses - where does one put in a response (especially if my response is not post-worthy)! I don't know if this is helpful or not, but it might be worthwhile to take a look at blogs that do have a lot of cross-commenter conversation. My rule of thumb would be: If the blogger can put up a post saying, "This is an open thread," and his or her readers will immediately use that open thread to start talking amongst themselves, that blog is a good example to consider. A couple that I've seen (purely as examples of strong commenter communities, setting aside any issues anyone might have with the political and/or geeky nature of the conversation) are Making Light at http://www.nielsenhayden.com/makinglight/ and The Whatever at http://www.scalzi.com/whatever/. Lisa, I took a look at those blogs and I've looked at some others too where there's discussion (my daughter sent me to Gawker) and I'm really beginning to think that those kinds of conversations may largely be a function of volume of people and their topic areas. I've noticed that political blogs tend to generate a LOT of back and forth between commenters because they are either amused or angered by other people and they feel compelled to respond. Michele, do you think that some of it may have to do with the age of the blog, as well? The Whatever has been around for 10 years now (although I don't know that it's had comments all of that time), with the author posting regularly for all of that time. I think the longevity and quality of his blog, along with the specific topics the author posts about, probably have had a lot to do with drawing a large audience of regular commenters. I absolutely agree that audience size is a big factor. If (at a wild guess) 90% of readers lurk without commenting, you need to have a large group of readers before you get a self-sustaining community of commenters. MIchele: I have the same issue as I'm using Typepad too. Sometimes what I do is email my comment to the next commenter with a link back to the post asking them to respond. That takes extra steps though .. and the commenters may not appreciate the extra email. "With Intense Debate Comments installed, blog readers can take advantage of features such as threaded comments, voting up your favorite comments, and tracking the comments of friends across any blog with Intense Debate Comments embedded."